What’s The Difference Between Tags and Categories, You Ask? The aim of this post is to provide an overview of categories and tags; there is so much more that could be covered. The whole reason why tags, categories and search widgets are used on blogs is to serve one purpose — help your readers locate the information they want on your blog. Readers want quick and easy solutions; too hard and they look elsewhere. While aim of using tags and categories is the same — to help readers locate information — they are used differently. 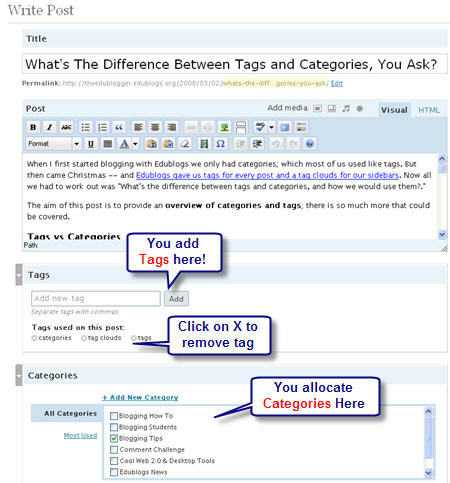 Categories and tags are displayed in your blog sidebar using the categories widget and Tag cloud widget. Let me show you. I’m currently using 17 categories on my Mobile Technology in TAFE blog (shown in the image on the right). Unfortunately I blog on a wide subject area which is why I’ve so many categories. Ideally I believe it would be better for me to use less categories and for the categories names to be descriptive enough without using two lines. Categories can have unique names and be wordy; you want them sufficiently descriptive so your reader understands the type of subject matter they will find when they click on the link. For example my Cool Web 2.0 & Desktop Tools category contains all posts that review, road test or tell my readers how to use web 2.0 or desktop tools more effectively. Posts can be allocated to more than one category; I assign twitter posts using the categories Cool Web 2.0 & Desktop Tools and Microblogging Tips similarly those on Flickr are distributed using categories Cool Web 2.0 & Desktop Tools and Photosharing and Editing Tips. Remember I’m doing this to make it easier for my readers to locate the information they need quickly. Tags are displayed on your blog as a tag cloud; clicking on a tag name will take your readers to all posts tagged with that term. Tags are normally short, one or two words, and are generally keywords (i.e. terms readers would be likely to use if they searched your site); terms that your readers will understand. The number of categories you allocate to a post are normally limited whereas you will use as many tags on a post as you like. The image of the tag cloud on the right is from my Mobile Technology in TAFE blog. If you checked out problogger sites — you will see each has their own preference as to which they use, or if they use both. However if you are planning on using categories, like I have, you really need sit down, think carefully about what content you will blog and allocate categories that reflect this. You may want to use the categories I use on my Mobile Technology in TAFE blog as a guide. If you’re going to use categories you need to do it properly; your readers expect that when they click on a category they will get ALL posts on the topic. If you add new categories this means you will need to go back through old post and allocating them to these new categories. Creating categories can be time consuming — if you want to promise a “good enough” system, then use tags, where no thoroughness is implied. You will still need to be consistent with tagging e.g. use widget, Widget or widgets not all three. 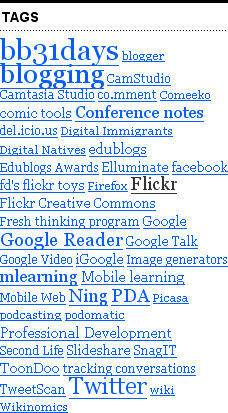 It’s worth checking out popular tags for ideas of what to use — check out Edublogs tag cloud, del.icio.us tag cloud, Edutagger tag cloud. Changing my Mobile Technology in TAFE blog from the old system of just categories to now using categories and tags did take time — I had to sort through 223 posts. If you’ve got lots of old posts it may be better to stick with how you’ve been doing it, and add a search widget to the top of your blog. I’m definitely not an expert with categories and tags; thanks to all the people who helped me out in coming to terms with using them. Recommend you also check out the difference between pages and post plus how you can use categories to separate different subjects or classes on a blog. Pingback: 3: Your first post … | Web 2.who? great description, the more I learn the easier it is. I am not sure if I will ever catergorize so many things but the possibilties are endless. thanks again. Rev D….. I deleted all the widget categories successfully, but they still show up on the main beneath the description of how to use the blog. How can I delete these categories. I was able to remove the Categories from the side of the page. Hi Carole, have you deleted the category widget from your sidebar? If you give me your blog URL I can check it out for you. But the more you explain about what you are trying to achieve the better. ok so I am late getting back Sue…blame it on the sunshine, blame it on the vino …blame it on the holidays….. I have decided to go with this one class at a time since I think my ideas are scaring the teachers who eventually I want to hand the comments over to…..is there ever enough time in the day to live a normal life and use the computer…I get on at 8 and by noon I am wondering where the day went……it is such a mystery! @Art I’m not convinced that technorati tags will have you been more findable on Technorati since technorati does search within posts and titles for the term (however there is some variation between blogging platforms – it does pick up Edublog tags). @Sandcastle sorry you can’t add tags or categories to pages. @drevans Go into your dashboard and click on Manage > Categories. Click on the name of the category you want to change. @Mrs Cunningham Does each of your classes from yr 2 to 6 have separate blogs or do you want to have all posts for the classes on the one blog? If all the classes on the one blog then you need to use Categories. Ok so I am still not too au fait with tags etc …..I want to add all my classes years 2 to 6 to my blog side bar,am I adding tags or pages??? or am I just confused .com !!! Thanks for the helpful information. How do I change the name of an existing Category? This sounds great and easy to do… but I would also like to apply tags to my static pages…. how can I do this? I’m actually running the Technorati tags as a comparison to the tag cloud generated by the WordPress plug-in. What intrigues me is the difference between the two result sets. I’m still reconciling which I think is more accurate, but if the Technorati one is assisting in getting my posts listed there, I won’t be removing it anytime soon. Thanks your Librarian – I hope this post helps you write your post on tags and categories. I definitely agree with you Art – there is a need for careful consideration on how you plan to use your tags and categories. I use Google Analytics all the time; I just haven’t got around to writing an article on it for the Edublogger however that is an excellent idea for identifying tag terms. I’ve been across to your blog and notice that you are using a technorati tag cloud widget. Can you tell me a bit more about why and how you use it? Thanks Dallas – I hope my extra information has helped – I look forward to checking out your blog in more detail. Thanks for the additional detail on tags vs. categories. I like your analogy of book with chapters as categories and indicies as tag details. We just posted on the subject for new bloggers and I think your post is the perfect fit for a ‘read more’ detailed overview on the distinction. Excellent insight on the nature of tags, Sue. Understanding the strengths and weaknesses of taxonomies versus folkonomies in tagging is one of the biggest challenges in creating a set that users can leverage to their benefit. I have a couple of blog sites for various audiences where I have used the categories in WordPress as the “core navigation” for the site. It applies a dynamic menu structure for the postings that fit well with the relatively unstructured nature of WordPress. The tags are used as a secondary, topic-oriented listing of content for more direct access. The combination has been effective so far but did require some planning and refinement. Here’s a tip from the world of web marketing: set up an analytics program such as Google Analytics and look carefully at the search terms people are using to find your site. If you use those terms in your tags you’re keeping people on the “scent of the information”. You are awesome! I have just started my own Edublog–like today!, and this was one topic I wanted to try and understand, so I could write about it for my students. Thank you so much! This may have to be my topic for tomorrow. I’m just wrapping up my first entry about RSS feeds–one entry at a time!